Center Moriches Town of Brookhaven Suffolk Co. This scarce and large hand colored map depicts the town of Moriches, Long Island, New York. 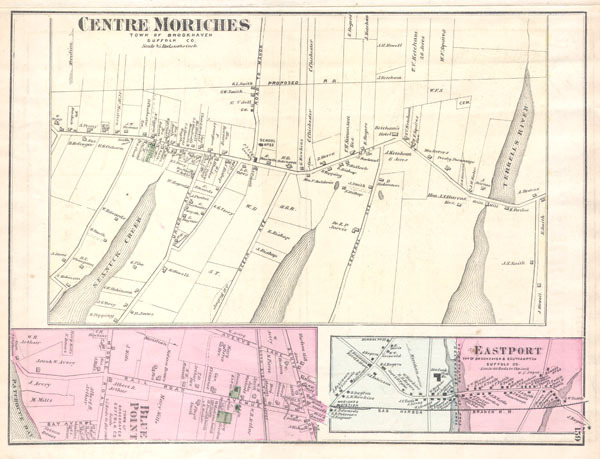 Map depicts the cities and towns of Center Moriches, including Brookhaven, Blue Point and Eastport. Eastport inset includes the town of Southampton. The extraordinary detail of this map, down to individual households with family names, make it a fascinating study for the family researcher or historian. Fine or perfect condition. Wide clean margins.